Basil and Mary died. Last weekend. The world is poorer without them, and I have a heavy heart. Where to start? I know Basil and Mary Smith well enough to say that death is the only reason either would leave their beloved farm in the wheatbelt of Western Australia. For around sixty years, that land had been the centre of their world. I first met Basil and Mary in 1982 shortly after arriving in Australia for the first time. I had graduated from the Royal Botanic Gardens, Kew*, and had been awarded the Ernest Thornton-Smith Scholarship for a botanical expedition around the south west of WA. Looking back, it seems like another era. The whole expedition had been planned using written correspondence. Only when I had been awarded the scholarship did I phone Basil and Mary to introduce myself to them. And then it was a brief, business-like conversation. International calls were rare and expensive and I could only phone when I was staying with my father. Typically for students, my lodgings had one general, coin-operated telephone. The first two weeks of the expedition were spent meeting Charles and Hilda Chapman. Like Basil and Mary, they had agreed to host me. Charles and Hilda were wildflower collectors and enthusiasts. And just like Basil and Mary they too were ‘farmer-conservationists’. Charles and Hilda had been wheat and sheep farmers and had a strong appreciation of and attachment to the land. Charles and Hilda had sold off their cleared famland but had held on to their bush block when they retired and moved to Nedlands. Having experienced the isolation of farming, Hilda warmed to city life. But Charles’ heart still belonged to his bush block, which he called ‘The Camp’, back at Winchester. Charles and Hilda had saved around 1,000 acres (I think) of kwongan habitat (heath and mallee woodland over sandplain) on their farm for posterity. At the time they acquired the farm, the state government insisted that land be cleared from fence to fence to maximise productivity. But Charles and Hilda found a way to hang on to some bushland. They chained it periodically, and then allowed it to regenerate. Though a compromise, it was successful, sustaining a surprisingly diverse range of species – as I would see later on. First off I stayed at the University of WA. I met the curator, the scientific and horticultural staff of the herbarium, and toured Kings Park. Then I boarded a Greyhound coach and crossed the Darling Scarp to enter the wheatbelt and to stay with Basil and Mary. They met me in a rather large old Holden and took me to their farmhouse. The entrance to their driveway was cleverly concealed – the ‘gate’ was a sheep wire fence that could be unhitched. Driving along the main road, you knew you had reached it when you saw the ‘discarded’ twin tub. That washing machine marked the entrance. On many occasions, when coming home at night, kangaroos would feed on the wheat growing in the field on one side of their driveway. They’d freeze while you unfastened the gate/ fence, but when you got back into your car, they’d melt into the woodland lining the other side of the driveway. The driveway went straight for a couple of hundred metres before curving towards the farmhouse and tractor sheds. In the middle of the drive were two or three huge, long meat ant nests. Their tops were often ‘mulched’ with laterite, and they’d surge angrily out of the nest as you passed over them. The farmhouse was a classic 1950’s style fibro country home, complete with a large library/ study. The kitchen was completed by an Aga cooker and a kerosine-powered fridge. The kitchen was wonderfully warm on a cold, windy winter’s morning when it was pelting with rain. The lounge, with a detailed map of Western Australia on the wall, was equally toasty on a winter’s night. On the open hearth mallee roots, gathered by ploughing, would burn slowly, heating the room very effectively. The sun lounge was generous, a perfect space for botanical slide shows. It’s coolness was very welcome after a hot summer’s day. I was very taken by these homely necessities, and they way they helped living in a dry temperate climate. The farm was paradise to this London-born gardener. It even had a plane. Opposite the farmhouse was a huge, netted vegetable garden (filled with orb-weaver spiders). In it grew citrus, grapes, herbs and vegetables. Outside stood a bird bath, modified by adding a slat of wood that allowed honeybees to drink and small birds to wash or drink. The farmhouse itself had two sides nestled by eucalypts. It ran on renewable electricity, and Basil had rewired it for 12 volts DC. A wind turbine generated power which was then stored in rows and rows of batteries. The batteries stood sheltered alongside the cool store and the huge walk in freezer, where Basil and Mary stored their supply of lamb. Basil also had diesel generators. Every Thursday, around 7am, Mary would hook one up to the twin tub for laundry day. The farm had recently been connected to scheme water, but Basil and Mary were used to relying on their own tank water. They preferred using rainwater for showering and gardening, using it sparingly. They introduced this Londoner to soap made from lamb’s fat and the three minute shower. First you soap up using abundant, non-potable bore water, then you rinsed off with rainwater. They reckoned scheme water was handy for jobs that didn’t require pure, good quality water – like washing clothes and vehicles. Only after the long, dry summer when their tank was low would they use scheme water for gardening. Basil and Mary bought something around, I think, 1,000 acres. Around 100 acres, in two blocks (separated by the main road from Wongan Hills to Manmanning) had been spared the chain. This remnant bush, mostly open Salmon gum and wandoo woodland on loam with a wedge of kwongan on yellow sand, would be protected by Basil & Mary from bushfire from then onwards. So much bush is burned so regularly, their plot is of scientific interest. Basil and Mary were absorbed by wildflowers. They studied and collected them, often using their Cessna to spot colonies worth visiting to collect seed, photos and pressed specimens. They collected extensively and proficiently, sending their collections to the Royal Botanic Gardens, Melbourne. Basil and Mary amassed a huge collection of botanical specimens, slides and books. They said they preferred working with the RBGM because they got better feedback from their scientists than from anywhere else. They were so proud to discover new species – like Templetonia smithiana, and new varieties or new locations for known species. They were especially fond of discovering plants for the first time after being first described. I too learned that discovery and rediscovery is infectious. 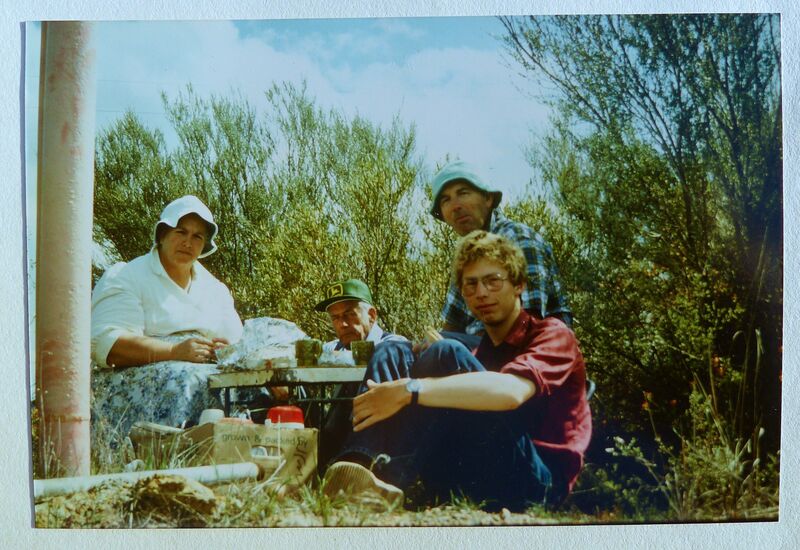 Basil and Mary’s holidays were camping trips across across the south west of WA. Sometimes they were joined by friends, like Dave Bell from Wongan Hills (a wonderful fellow, a former school bus driver with a passion for Western Australian Eucalyptus). Basil and Mary loved station country, especially in a ‘daisy year’, when ephemeral wildflowers filled the landscape. Basil was a radio ‘ham’ and spoke routinely with station owners. Sometimes Basil & Mary followed the routes of early colonial explorers. Mary loved native birds, she studied them keenly, and she adored native orchids and Verticordia’s most of all. I could listen for ages to Mary’s bird stories. I recall soaking up stories about meeting the mysterious (and now threatened) Mallee Fowl. Basil was passionate and knowledgeable about Eucalyptus, and he infected me with his love for mallee species. What Basil didn’t know about the geology, soil landscapes, natural drainage systems and weather patterns in south west WA wasn’t worth knowing about. Such happy, life affirming days. I greatly appreciate Sue Norville informing me that Basil and Mary have passed into history. Thank you Basil. Thank you Mary. Your lives were well lived. May your farm, your land and your wildflowers live long and prosper. Mary Smith helped identify, collect, document and propagate new species, subspecies and varieties of Verticordia, and maintained a collection of them. * The graduation occurred while I was in WA. I had permission from the Director of Kew Gardens to be absent from the graduation ceremony. Thank you for sharing, Jerry…those are such lovely memories. We will be thinking of you, and of their families. I only met Basil and Mary Smith briefly, but it was one of those life-changing times. No native of the Dreary Isles like me can have any idea of the sheer hard work it takes to eke a living out of the ancient, dry soils of Western Australia. Basil and Mary thrived and flourished there for the better part of a century – even as farmers all around were going broke. Why? Because they loved their land – and even more importantly, they listened to it, responded to it and cared for it. Vale Basil and Mary. In your life and your death you are an inspiration to more people than you could possibly know. Well done Jeremy, you’ve done them proud. It’s often the quiet ones that leave the most behind. Dear Jerry, My mother, Lorna Noonan (Née Serisier) boarded with Basil Smith’s family in 1940 when, as an 18 year old, she went to Manmanning as the only teacher at the local school. In recent times, mum had reestablished contact with Basil and had come to know Mary. She had spoken to me a number of times about their achievements and the wonderful letters they had exchanged with her. I was speaking to her today and she told me how upset she had been recently to find that they had died. As we spoke, I googled them and she was moved as I read your beautiful tribute to them. Mum would like to write to you. If that would be OK, could you email me a postal address to xxxx@hxxxx.com.au? Jeremy, it was wonderful to read your memories of Basil and Mary. They were friends of my parents and opened my eyes to a whole new world of ideas when I was a child – firstly through the dozens of books Mary lent me, but also of course because of their revolutionary ideas about maintaining habitat for wildlife as an integral part of their farming operations. That was a revelation in the 60s, when the government was pushing farmers to clear all of their land as quickly as possible. Mary loved life and accepted the foibles of those round her, yet I think in those days she and Basil were seen as wildly eccentric at best. They never wavered in their path and I have always admired them. They were fabulous people and I think they could have looked back on their lives, not just without regrets, but confident they had lived by their principles and done everything they wanted to do. It has been so pleasing to get feedback about this post about Basil & Mary. I hadn’t expected their friends and friends of their friends to connect with my website. I was deeply impressed by them and their ‘model’ farm. The experience of staying with them and botanising alongside them will always remain precious to me. Hi Jerry, Thanks so much for replying. My mother really appreciated your post, too, when I printed it for her. (She’s 89 and internet-phobic!) She first realised all was not well with the Smiths when her Christmas card was returned, and it softened the blow a little to be able to give her your post when I found they had died. You know, it really came through in your piece how fond you were of them and how much you respected them, and somehow that was a great comfort. My family will always remember the Smiths arriving with cutlery, crockery & all the necessities of life when our family house burnt down. It’s a long time ago – I was three and am now 58 – so details are hazy but it’s become the stuff of family legend. Although Dad was at school with Basil, Mum thinks the 2 of them didn’t have a lot of contact after that untill the fire when my parents were in their early 30s., so it was a particularly generous gesture. They were certainly firm friends after that, for another 55 years. I’m rather hoping that the Smiths left their farm to Australian Wildlife Conservancy or something similar. It would be a terrific memorial to them.